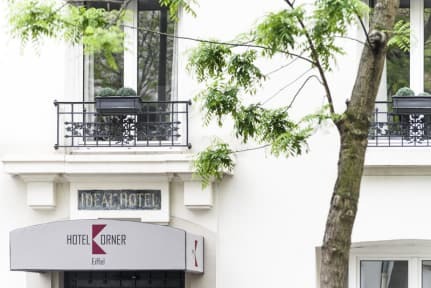 Korner Eiffel Hotel benefits from its privileged position at the heart of the business & commercial district of Beau Grenelle with its cinemas, restaurants, shopping centers and internet cafes. The hotel is located between the Park des Expositions/Exhibition Center at the Gate of Versailles and the Eiffel Tower (both just a 15 minute walk away). The hotel is only a 10 min walk away from the River Seine and from the French Statue of Liberty! And just a 20 minute walk from the Montparnasse tower and business centre. Entirely renovated, the hotel offers you the comfort of its 35 sound proofed rooms, each equipped with bath or shower and WC, and color television with satellite channels, direct dial telephone lines and automatic alarm clock. Our staff speak French, English, Spanish, Italian, German and Arabic. We also offer our clients a public Internet access terminal in the lobby. Please Note: We will pre-authorize your card for the first night directly after booking.